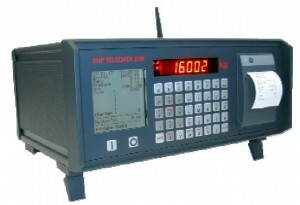 Wireless weighing data transmission using our tele-data solutions. Once installed and interface to any EHP crane scale the weighing data can be displayed, processed, saved and printed connected to a customer or order number and further individual data. Upto 8 freely programmable fields can be setup so that items such as order no, batch no etc can be entered prior to printing using its built in thermal paper printer. Data records can be entered via alphanumerical keypad using various profiles and saved or by the use of an optional PC keyboard. Its internal alibi memory also allows for storing upto 65000 records to comply with weights and measures legislation. The wireless reception range is 500 m from any unit compatible EHP unit.